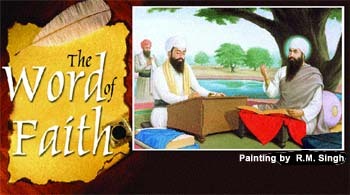 THE Guru Granth Sahib is indeed unique in its thought, literary expression and the message it continues to communicate centuries after it was written. Exalted thought needs to be transported on the vehicle of language to reach the masses. Poetic expression lifts prose to a higher plane. THIS is the story of a city which was founded by Guru Ram Das and developed methodically by Maharaja Ranjit Singh. An invitation was extended to a varied lot of people from 22 different vocations to set up shop, and start a modern city around the Golden Temple. A week-long festival of documentaries in New Delhi showed the growing richness and dynamism of this genre of films. Saibal Chatterjee reports. A small, tentative step taken a little over three years ago has now grown into a full-fledged movement. Confirmation of that salutary expansion was available all through the duration of Open Frame 2004, a week-long international festival of documentary and reality films that concluded in New Delhi's India Habitat Centre on September 2. The recent trend of veteran actresses getting plum roles seems a healthy sign for a Bollywood obsessed with nymphets. But are things really changing? Lata Khubchandani checks out. IS Bollywood suddenly waking up to the potential of veteran actresses? It would seem so as there is a sudden spurt of demand for 40 plus, even 60 plus actresses, for the big screen. It is tempting to assume that Bollywood is ultimately paying tribute to its veterans — something that has not been done hitherto. FOR those bitten by the travel bug, few regions in India seem as enticing as this remote, unspoilt northeastern state with its pristine forests, distinctive tribal culture, ancient Buddhist monasteries and high snow-clad Himalayan peaks. UNITED States President George W. Bush was in a classroom of children in Florida reading the poem "My Pet Goat" when he was notified of the second attack on the World Trade Center. But he failed to react and in fact continued to talk with the kids for the next seven minutes before leaving the classroom. Stories from the Raj: Sahibs. Memsahibs and Others. by Pran Nevile. Indialog Publications, New Delhi. Pages 186. Rs 250.
edited by K.R.N. Swamy and Meera Ravi. A Writers Workshop Greybird Book, Kolkata. Pages 126. Rs 200.
by Lori McFadyen. Hope India Pages 201. Rs 395.